I cannot remember the time I used a drug store foundation. I actually used to quite like the Revlon Colour Stay and the Photoready but I'm loyal to Estee Lauder when it comes to foundation so I don't tend to stray from their core foundations. Rimmel Wake Me up is one of those "sparkly" foundations. Light reflecting particles that are supposed to make you look flawless with tricks of the light and give your radiant and awake glow. I do think it lives up to these claims. On the skin it looks fresh and glowy with all my pores and imperfections blurred out. The glitter that seems to be very prominent when you look at the packaging is not noticeable at all on the skin, and you don't end up with Edward Cullen glitter ball face. When applied it feels a touch heavy, Like I can feel it on my skin. It doesn't look heavy though, the finish is very natural leading slightly too dewey for my personal tastes but I do powder it down to a matte finish. The product itself feels very thick and heavy when pumped onto the back of my hand, almost gel like. 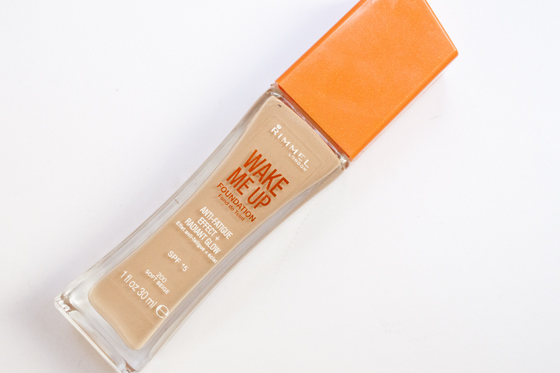 Rimmel Wake Me Up Foundation also has a light fresh scent to it, Which personally I don't love. I don't like the idea of using fragranced products on my face as generally it makes me break out. I used two pumps for my whole face and to give the coverage I like (medium to full) as well as using concealer and a powder. However I don't think that makes it bad product because I do this regardless of what foundation I use. I've been using my Real Techniques Buffer brush to apply which makes it apply smooth and streak free to the face. The coverage is different depending on how many pumps you apply though, I do find it covers all my redness, scars and blemishes well. Overall I do really like this foundation which surprised me. Its not the best foundation since sliced bread and I doubt it will be replacing my MUFE HD or Estee Lauder Double Wear, but I do really like it and I have been reaching for it on regular rotation. For a high street offering its one of the best I've ever tried in a very long time. I haven't experienced any skin problems like breakouts or dryness. I major things don't like is the scent, the fact that its not oil-free and oiler skinned girls (like me) really need to use a powder (Rimmel Stay Matte perhaps?) to keep you matte. But its good for a foundation that retails at £8.99. 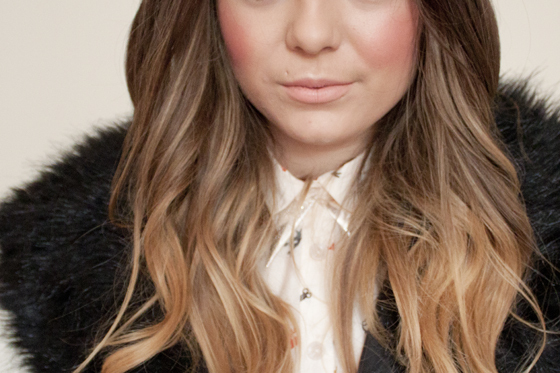 Its definitely one to try if your looking for a new foundation and don't want to splash out. I'm not converted to drugstore makeup just yet but I know for sure I'll be using this one up! i think it's amazing, and i'm a foundation snob! like you, i have oily skin so using a powder is a must, but i can live with it. so good for the price! I've heard great things about this foundation but I'm still a bit skeptical, I've got very dry skin and I'm worried this will show up my flakies! It does look similar to the photoready which I love! Great Post! I use this on a daily basis but have to mix it with another lighter foundation because the shade range for this is rubbish! Other than that though, I do like it! I have a sample of the Rimmel Wake Me Up foundation and it is pretty decent actually! ps. love the blush too - what is it? makes your skin have a lovely glow! I have two satches of this that I have been putting off using. I might try them now! I really want to get this, i need to just stop putting it off! This foundation seems to be brilliantly popular with everyone as as I am in the market for a less matte foundation than colourstay ill have to check this one out! I loveee this foundation. It gives my skin such a beautiful glow even after a rough nights sleep! I really want to try this foundation! I have a sample of that foundation that came with the magazines, OMG, even though was not my skin colour I still tried it, aaaanndddd never again..... since I have a oily T-zone it was hell for me, I´m not really into having to touch up frequently with powder. I felt that my skin on my nose area was like melting rsrsrsr Oh and the sparkle, I could see it very well and I also didnt like it... it´s just wrong lol.